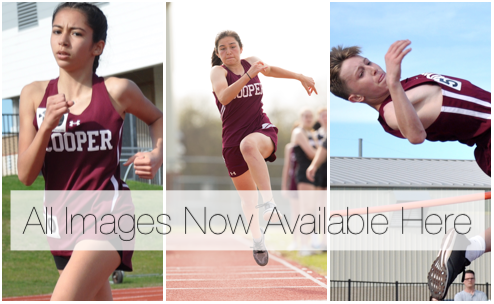 Cooper Junior High School track and field students competed in the Scallywag Invitational JH Meet at Wylie High School on March 21. Other schools in attendance were McMillan, Burnett, Ereckson, Ford, Cain and Burnett. CJHS Coach Jeffrey Van Meter excitedly said, “We could not be more proud of our Cooper track teams and all that competed!” Team finishes were first place for seventh and eighth grade boys, third place for eighth grade girls and fourth place for seventh grade girls. First place individual performances were awarded to Aidan Isom, Chioma Obi, Christian Bearden, Grace Garza, Jacob Booty, Jason Nwokedi, Landin Wolfe, Leann Tran, Quade Thomas, Samantha Schwarz and Stetson Sarratt. The eighth grade boys 4x100 team (Brooks, Chum, Lianthong, Nwokedi) placed first, along with the eighth grade boys 4x200 team (Lianthong, Burkett, Resurreccion, Nwokedi). The Patriots will compete in the Lovejoy Willow Springs District Qualifier at LISD Stadium on March 28 at 4:15 p.m.
All images avaialble to view and purchase here.